Happy Easter Everyone! Today the sun is in and out, and the winds still very high. The waters are calming down a bit but a rough surf advisory remains in effect, for boaters and bathers. This is probably the last Sunday on the beach for many tourists as this coming week starts the exodus back to their respective homes until they return next Winter. The nights still very cool but I can't complain, as I just got back from Canada with temps as low as -27 degrees with a Northwest Wind at 50 kmph. I was warm when I boarded the plane to Toronto and then never felt warm again until I came down the steps back in Barbados. I really am spoilt living here.... Have a great day.. I haven't posted for the longest time - With the Christmas season and then New Years, my trip back up to COLD Ontario, and now taking care of my British boarders. So.... the weather in Barbados has been ok - sunny around 83 degrees with the odd shower - but definitely chilly at night - for me anyway. My boarders think this is absolutely perfect. The seas are rough - starting today they are up to 4 meters from 3 - and the weather guy says that will continue until Saturday. The trade winds are wild, but hey no mozzies, can't think of anywhere else I would rather be in the month of February. Happy Valentines Day everyone. Christmas Greetings from Barbados. The weather has been fantastic these past few days, and I hope it continues for the Christmas Season with the parties and family gatherings. Yesterday was my Christmas "Hash", for people do not know what that is, every Saturday in a different location, somewhere in Barbados, a large group of people meet, to run, jog or walk a trail that has been set in the morning. We go through gullies, cane fields, climb cliffs, mud, streams, whatever - it is a lot of fun, and there is the exercise point of view. Then after we usually barbeque and socialize, and have a few drinks courtesy of Barbados Rum Refinery and Bank Breweries, which takes care of the exercise part. One large party every Saturday!. I have lived in Barbados for 10 years now and this past year with joining the "Hash" group, I have been able to enjoy remote parts of this island one would never see in a lifetime. Yesterday was held at Kent Castle, it sits on a hill overlooking Fort George Heights. The view of the ocean was spectacular and the gist of this note is the fact that when the last part of the huge golden ball of the sun finally slipped into the ocean, and everything being just perfect, we were given the incredible most "vivid green flash" I have ever seen, and I have seen a few. The applause, and "oohs and ahhs" was definitely deserving of the show we were witnessing and I am sure it was a sight many of us will remember for a long time. To complete the picture on the opposite side, high in the sky was the "one night short" of a full moon, beaming down. Just incredible..Today to continue our Christmas Hash Celebrations, we are going out on "Heat Wave" for a catamaran cruise for the day. Have a great Holiday Season everyone and be safe. All the rain we received yesterday, during the night and looks like it is staying around today as well, is coming from a feeder band from "Olga". I hope it moves pretty soon as the ground is sodden and it so grey, very windy and cold. Just like Jacquie in Grenada for the first time in years all my doors were closed shut because of the driving rain and the dampness in the air. Downright chilly.... I think on a count my dogs only left the house to do what they have to do, 3 times, if that. Amazing how one takes for granted that the sun will be out everyday and when it doesn't happen, it is so upsetting. But I guess this is still better that all that snow and freezing rain they are dealing with way up North. Around 3:00 yesterday afternoon while seated at my desk, I suddenly felt a strange jolt...I looked around a bit and realised that my laptop was shaking as well....I promptly stood up and saw some others around me looking quite bewildered and then someone yelled, "the building shaking"..By this time, all I could think of was the building would collapse, so I grabbed by keys and handbag. The filing cabinets and doors started shaking and we all beat a hasty retreat to the nearest exit. At that time, nobody had any idea that is was an earthquake. Once outside, I attempted to use my mobile phone to contact my relatives to ask if they had felt anything thinking it was only contained in my area at the time. However, the mobile service had stopped working and it was then that I realised something serious had happened across the island. Fortunately, I was able to contact my mother after a few minutes and she reported that she too had felt a tremor where she was located. The newscast later reported that some marble tiles had fallen off a building in Bridgetown and damaged a car and that the back of a house in St. George had collapsed and fallen into a gully. All in all, we were very fortunate across the island. Scary moments here high up in St. Thomas Barbados – my house was shaking like a ship – it was hard to tell when it had stopped. Afterwards, when I was sure, I looked out and my pool had mini tidal waves that swept over the deck absolutely soaking it. Reports range from effects so far down to Trinidad and a possible second hit there, up to Tortola. Cell phones are down. Hoping no major damage given the amount of caves underground in Barbados. It lasted about 30 - 45 seconds I think – I estimate that only because I was on the phone, hung up and managed to get my three big dogs (not easy) into a cupboard under the stairs (with a sturdy doorway). So it was not a couple of seconds, that’s for sure. Any words on after shocks – jeez I have only read about this before! Hope all are OK. WOW!! At two minutes to three we had an earthquake - the first ever for me - The kitchen started shaking the cupboard doors flew open and the chandeliers in the Living Room were swinging back and forth. It only lasted for a few seconds but it seemed forever. I yelled at my dogs and we ran outside into the garden. The radio is saying it seems to have gone right through the Carribean. Reports later will give us more information. Tomorrow is our Independence Day Holiday and you can imagine the traffic everywhere. Apparently in Bridgetown right now all the people are on the streets as they evacuated all the buildings. News just in - 7.3 on the Richter scale near the Windward Islands. 7.7 in Trinidad. WOW again. I hope we have no after shocks, once was enough. Today in Barbados just gorgeous. We have had heavy rains these past two days, which we really needed, but today the sun is back out - the wind is from the East at 22mph - so no humidity. Maybe these winds will blow some of the mosquitoes away - they sure have decided to appear in large numbers all of a sudden. Here in Barbados this past week the heat has been incredible. - with no breeze whatsoever. In fact this afternoon at the airport the heat index registered 99.1 degrees at 2pm and it felt like it too. All anyone talks about at the moment is the intense heat and lack of rain....It looks like, according to the satellite, we are about to have a change - as long as it isn't too drastic - I'm sure the tourists are just loving this weather. I would appreciate some showers for my garden but hopefully nothing else that I would have to worry about. The season has been great so far - do you think it could stay that way - doubtful, but hopeful. ....if T.D. #6 isn't already Felix. Seems so on the outside...I tell you I just rode up the upper part of St. Lawrence Gap and the wind....Aih Yaih Yaih....pushing me back and kicking up some serious dust in my eyes. Not much rain, and when it does; very light and at a very steep angle. The trees and dancing and bowing. The Moon peeping out from intermittently from behind the fast moving clouds. I hope the other islands fear O.K. Seams like this year, they are forming or approaching at very low latitudes. Dean came close to BGI, and T.D. 6 even closer. Gusting winds and squalls have been affecting Barbados for some hours now as TD 6 passes to the south. Judging from the movement of the tops of large trees around, gusts could be easily exceeding 40 mph. It is clear that this system seems destined to develop as it enters the Caribbean so Jamaica and points west should keep a careful eye on this one. I see that Gert has twice reminded us not to focus exclusively on the eye of the hurricane. We need to keep hammering home this essential information. This idea seemingly current among many people that the eye was the hurricane started a couple of years ago when the TV networks began bringing the impact of hurricanes into our drawing rooms. Reporters developed a fixation with the eye and since we take many of our cues from TV, the idea seems to have spread that if the eye misses then the hurricane has missed. The eye may only be ten miles across but a hurricane can cut a five hundred mile swathe of destruction as it moves onshore. The folks in Belize and Southern Mexico should bear this in mind as Dean continues to strengthen. 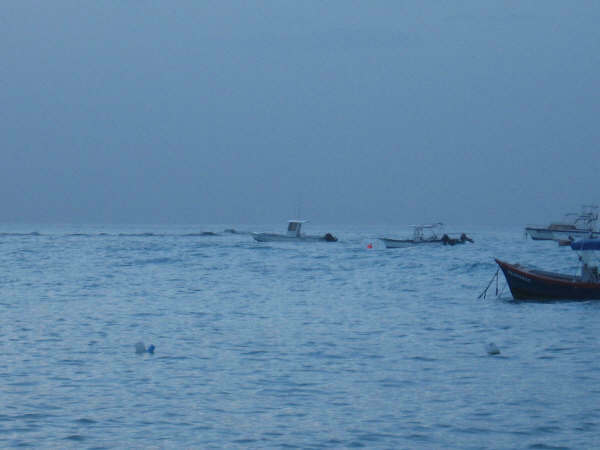 This what it looked like at dover beach this morning at 7 a.m.
As at 7.00 am this morning, the official all clear has been given to Barbados. This means that all Barbadians should start the process of returning to their normal routine of a Friday morning. It is still expected to be a bit windy and some occasional showers. Few reports of some fallen trees which temporarily blocked some roads , but they are now cleared. So it appears, all things considered, Barbados weathered the storm for which we are all grateful. I am in the south of the island. The sound of a falling branch just woke me. It is 4.00 a.m. A fairly steady rain is falling and the wind is gusting to storm force levels. A good guage is the extremely large mahogany tree on the perimetre of my property. It is swaying under the effect of the wind as it did with the passage of Ivan so I would estimate that the wind speeds in squalls are in excess of 50 mph. from the latest satellite photo I would assume that this will keep up for another couple of hours. Meanwhile by the looks of it, the folks in Martinique, St Lucia and Dominica must now be experiencing the full force of Dean, we hope without excessive damage. I hope my friends in all these islands stay safe. Looking down the line, Jamaica needs to wake up to a possible onslaught of a very dangerous hurricane. Having survived Gilbert there..did a really stupid thing which was climb up on my disappearing roof to secure it as the eye passed ..only to be caught unawares by the eyewall which nearly blew me away..I know what I'm talking about. The historical records show that since the seventeenth century almost every system which passes by Barbados goes on to affect Jamaica. - North vs South comparison - 3:00 a.m. I was just speaking with a friend who lives in St. Lucy and he says it isn't windy by his home. He said it is raining, fairly heavy, but not the kind of rain you would associate with a storm. While here in Christ Church, it was still Very windy for the last hour and it has been raining quite heavily off and on. What is strange to me is this storm is passing NNW of us so I thought St Lucy would be getting a beating. I guess we will know more when the morning breaks. That's it for me - I know there will be work in the morning so I will force myself back to bed. I look forward to the reports and pray that we have very minimal damage - better yet none - on the island. The winds woke me up around 1 am, but I am not sure how long we have been impacted. High, very high winds... with gusts, but minimal rain. About 2 am, I ventured out in a patio ( I know - I know, it was just for 30 seconds) that faces the west where the breeze usually is minimal. Very gusty and windy from the what appeared to be all directions. Trees really dancing in the wind... I guess because it is night it feels quite creepy. Only heard one odd crashing noise earlier outside and I can't sleep with all those eerie "storm" wind groans. Not much more to update than this for now. Reporting from the East of the island, the wind has picked up considerably...Unable to say what the windspeed is at the moment. But suffice to say, that the sound woke me from deep slumber...Of course, it is dark outside and with the present conditions, I dare not venture out until daylight...There is no rain, nor thunder and lighting at the moment...Will report again as conditions warrant. To my fellow islanders who are in the path of this storm, stay safe...We are praying for you. "It's Crop Over - Party time starts now"
The rains are here with high winds. It is careening out of the North NorthWest. I was just standing outside in the garden with the dogs for the last time this evening and I could see the cloud layer moving in and then with a whooshing sound the rain was here. The temperature has dropped by quite a few degrees. Stay safe everyone. - Storm Warning in Christ Church 9:30 p.m. I am in the southern part of Barbados (Christ Church) it is fairly calm. Early in the evening we had varying types of showers (heavy downpours and light drizzles). For about 2 hours the air was quite still, but within the last half hour it has started to become breezy again but so far no strong wind, no gusts, no rain. It is really difficult to tell what is happening in the dark. I will go out on my patio to see what is going on in a little while... I imagine there will be more to share closer to midnight. its just after 9 pm local time, the rain has stopped and its quite still outside. its such an weird feeling its REALLY still. Lets hope Dean isnt too mean. thankfully we are only getting the southern portion of the storm which is usually the weaker half. I still pray that things work out well. hope to give u another update soon if things change. will deteriorate a bit more especially in the northern parishes of the island. birds because they are at their most vulnerable right now. We have just had our first taste of the outerbands - the rain and winds were wild and have only just now steadied down. My thoughts and prayers go out to Dominica and St Lucia, and anywhere else that Dean will play havoc with, here in the Lesser Antilles. Take care everyone and be safe. Will report later. At a press conference by the attorney Gerneral after a planning meeting it was announced that the Grantley Adams International Airport will be closed at 9.00 pm tonight and re-open at 6.00am on Friday. 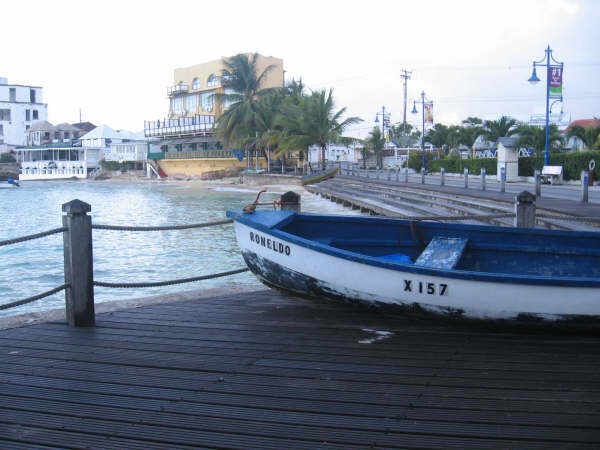 Just took a trip to Bridgetown where the populace is quietly going about its buisness with no apparent anxiety. The supermarket lines are longer than on a normal Thursday. All Catergory one Hurricane shelter wardens have been asked to contact the chief warden with a report of the readiness of the shelters, in the event that they have to be used. Forecasters here seem to be expecting squally weather from tonight sometime and some fairly nifty winds at about 40-50 mph. Barbados woke up this morning to hear that Dean was now a Hurricane one system and that Barbados is under a Storm warning. the head of our disaster services has indicated that there will be a meeting later in the morning to assess the readiness of the country for any eventuality. 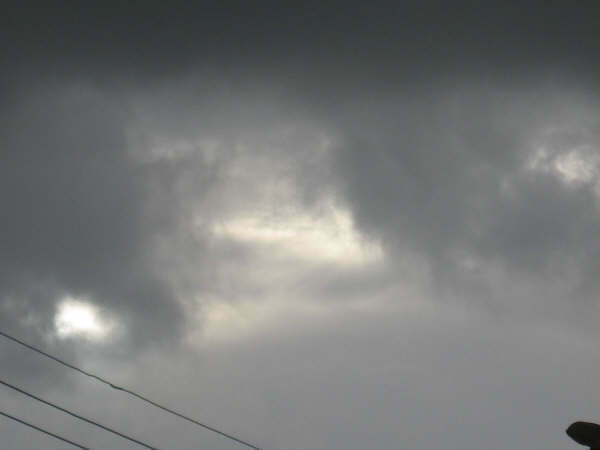 the sun is trying to drive through some fairly cloudy skies at this time. EVeryione...please be safe out there and above all be prepared. Whats up with this system....seems to be jogging just slightly north of due west then west then then the former agiain....anyways this is not one to be taken lightly...current sat images shows a distinct eye wall trying to form. See attached pics taken at aprox. 6 a.m. from the st. lawrence boardwalk looking out towards this little bay. See the owner of this boat aint mekkin' no sport. At about 13.00hrs today, the Government Met. Office at the Grantley Adams Intl. Airport in Barbados issued its firts advisory on Tropical Storm Dean. Dean is now about 920 miles east of the the Lesser Antilles, moving West near 20 mph. At the moment we are enjoying a pretty fair day with just a few scattered showers from time to time. It's still bright and sunny at 14.00 hrs. Nevertheless, time to start preparing for whatever Dean is bringing. Dont forget to stay tune to your local Met Office advisories...next one is at 17.00 hrs. IFRARED SAT IMAGE AT 10:15 UTC SHOWS, IN MY OPINION, THE CDO TRY TO FORM IF NOT ALREADY ESTABLISHED. WHICH PROBABLY MEANS AN INCREASE IN INTENSITY BY THE NEXT ADVISORY. STRANGELY ENOUGH I WOKE AT 4:54 A.M. TODAY AND THE BIRDS WERE SCARCE AND THE AIR WAS STILL. THE ATTACHED PHOTO SHOWS THE GRAY SKIES, AND ACTUALLY NOW WE ARE IN THE MIDST OF A LIGHT SHOWER ON THE SOUTH SIDE OF THE ISLAND. LOCAL NEW NOTED THAT "AN WAS BEING KEPT ON DEAN" I KNOW MY EYES ARE. 13:55 UTC GFDL Model run doesn't look good for the lesser antilles. We'd better keep an eye on this one, whose track not only look Ivanesque but also, Davidesque, and Janetesque just to name a couple. Absolutely gorgeous day here in Barbados. Lovely breeze, sunny and puffy clouds passing through. Great day for working out in the garden and I have just come in to see what is new with "Dean". Models still showing a variety of possibilities. Not too many here on the island seem to realize that there is a strong T.D. coming into the Caribbean, and the news & weather media certainly have no information regarding it. Probably will be a last minute advisory. - DEAN in the making? UH OH! 5:05 A.M SATELLITE [WATER VAPOUR IMAGERY] LOOKS LIKE 90L INVEST IS ALREADY A TROPICAL DEPRESSION. ALSO SEEN TO BE TAKING ON A MORE SOUTHERLY MOTION. STILL A WAYS AWAY... LETS SEE WHAT HAPPENS. Correction - the colour turquoise is from the Ramsdis on-line satellite scale - Storm Carib is showing just red. There has been an enormous amount of rain fall this morning - it seems Barbados is stuck under the trough system, and doesn't want to move. You can see on the Storm Carib Satellite picture that our "precipitation" colour is turquoise which on the scale is very heavy. Lots of water everywhere, I feel sorry for the pedestrians trying to negotiate their way without getting drowned by what's falling from the skies or the passing cars. 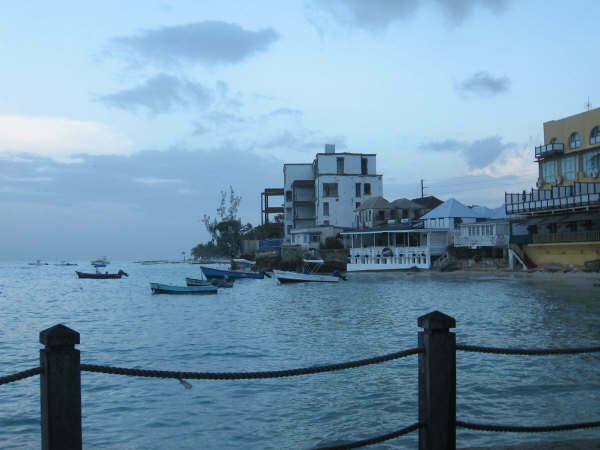 It is a very dark morning here in Barbados. Yesterday was another scorcher with an odd shower here and there. Around 1.30am the RAIN started and it came in wild squalls. At the airport the rain gauge measures 24 mm has fallen overnight but I am sure we have had much more than that on the South Coast. It is thundering at the moment and the rain is starting up again. The trough system should be here all day by the looks of the Storm Carib Satellite picture. Going to be a slow start for the rush hour traffic, into work. Today on the south-coast it was sooo... HOT. The sun was just blistering and there was not one breath of a breeze. Then at 5pm we got a short shower as it has been black over the North part of the island all day and I guess a few clouds moved our way - and now it seems to be hotter than ever. My dogs cannot find a cool spot and are just panting up a storm. I think maybe it might be time to try the a/c in my bedroom tonight - I know they all will be lining up outside my door when I turn it on later to cool the room down. It is quite comical to see them in a line waiting to be the first in - and then you can almost hear them sigh in relief, as they plop onto the floor for the night. This evening at the National Stadium there are numerous headliners to perform all night, then tomorrow morning all the different groups complete with their colourful cropover finery parade for the judges for this years winner. Then they will head out along their parade route and end up in Spring Garden Highway. If this heat continues I would assume that the Barbados Water Co will provide showers along the roadways so the revelers can cool down. Here's hoping tomorrow will be a safe holiday for everyone - we have had enough accident fatalities this week. - The rainy weather is lovely! I listened to the radio this morning at 6:15 and heard that there'd a tropical wave affecting us by this afternoon. As I had laundry to do, I jumped out of bed and had the first load on the line by just after 7! By the time the second load was put out a little after 9, afternoon seemed to have come early. The sky darkened, the wind picked up, and I thought this is going to be touch and go. The first squall came through just after 9 and the weather has been squally ever since. The temperature is cool and there is a steady breeze, which kicks up near the squalls. The satellite shows that the area of unstable weather is quite large and Bim has a little way to go before we're seeing clear skies. Today is Emancipation Day and this is also the height of the Cropover season with parties and events in abundance. I hope everyone stays safe on the wet roads. 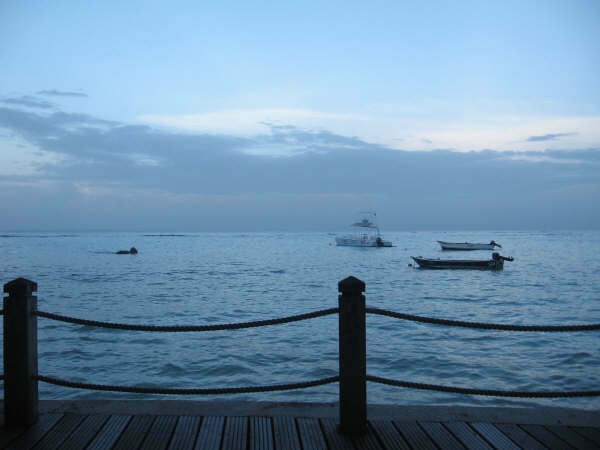 Today in Barbados is a national holiday - "Emancipation Day". This morning has started out very sunny and warm, but soon it is to change. We are expecting rain, gusty winds, and possible thunderstorms. I sincerely hope it holds off until this evening after everyone has enjoyed their special day. Like other correspondents I too am back from traveling for 4 weeks to Canada to see family. The weather while I was in Toronto was absolutely fantastic. Sunny and warm with no humidity. Now I am back to Barbados - and today was a scorcher - the sun was so hot with very little wind and no humidity either. This coming Wednesday is a national holiday Emancipation Day and then on the weekend is our Crop Over Festival. Long range shows fair weather well into next week- unless some changes occur. So far so good. Looks like an item of interest is signalling its existance in the mid atlantic. A well defined tropical wave with a surface low analysed is making its way westward. Forecasts are not all in unilateral agreement on the future of this system but its does merit close observation as it does retain the potential for further developement. Lets keep our eyes trained on this!!! Could be interesting!!! 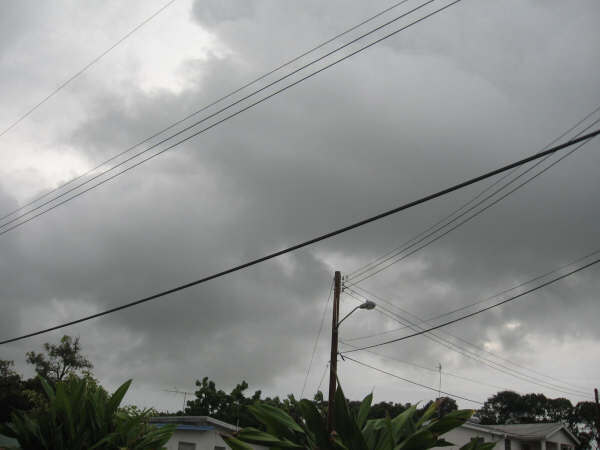 Here in Barbados today we are partly cloudy to occasionally cloudy with some scattered sharp showers. seems like some semblance of a trough is about and from last night some patches of low level cloud have been moving through and producing some shower activity with their passage. The haze has lifted somewhat as it usually does preceding any potential activity. So lets monitor the wave to the east to see what the next 3-4 days might hold!! We awoke to generally cloudy to overcast conditions this morning. Things continued to deteriorate quite quickly with the "ceiling" getting lower and it was not long before we were into some moderate to heavy showers. There was one instance of thunder which was'nt very near. kind of heard it in the distance. there were definately some CB cells around because my lightning sensor was screaming quite a bit. However things are improved now and we actually have the sunshine with us again at least at this point!!!! Some more showers are likely although the bulk of the activity seems to be keeping well south of us. looking at the loops there is a bit of northward drift evident but it remains to be seen how far it will get. The ITCZ maybe adding its part in there somewhere. Winds are fairly brisk 15-25mph proably a wind surge that is following the wave. More from Barbados later!!! Happy to report that around 1pm the sun actually came out and it has been a pleasant warm afternoon. Things are starting to dry out nicely especially my laundry from three days ago. 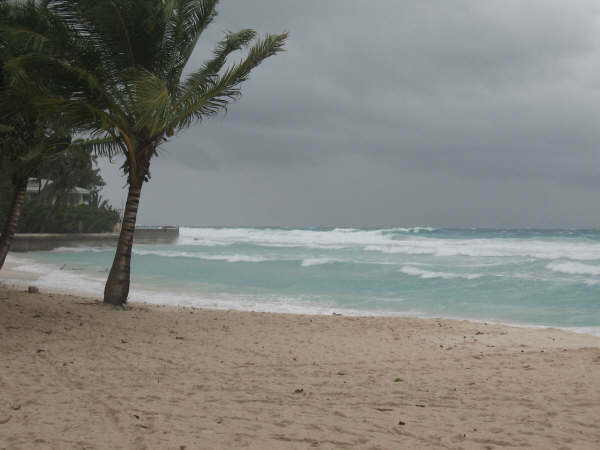 Starting our third straight day of rain here in Barbados. Thunder storms with heavy rain in the night, and at the present time just soaking rains falling. We have had nearly 100 mm in the past three days. The weather people say Barbados is dealing with a trough AND a tropical wave. The day to continue with showers and possible thunderstorms. Hopefully tomorrow we can some sun to start drying out!! We had serious rain all night in Barbados - then around 6.45 am the lightening and thunder became constant. The lights all came back on as it was so dark, and the street were flooding with the falling rain. You could not see across the road, and for at least 45 minutes on a busy rush hour Friday, there was not one car passed through. One forked lightening strike was so close, it blew out my computer telephone modem and I have just returned from the shop with a new one installed. Usually two of my older dogs sleep through any storm but this morning they were barking and howling with the others. My back garden which is set in a hollow is under water by at least 2 feet, even now after draining all morning. Throughout the morning we have had other passing thunder storms and it looks like another is starting. So I am shutting down and pulling out my telephone cable this time. Will let you know tomorrow just how much rain we received. We finally have RAIN. It started as showers last night around 10pm and throughout the night, we have had thunder and lightening, with heavy downpours. 20mm so far, which is twice as much as the entire month of May. Supposed to keep raining off and on all day and into tonight. The tree frogs are singing their hearts out. This will definitely perk up all the foliage and lawns which have been desperate for any kind of moisture for weeks and weeks. 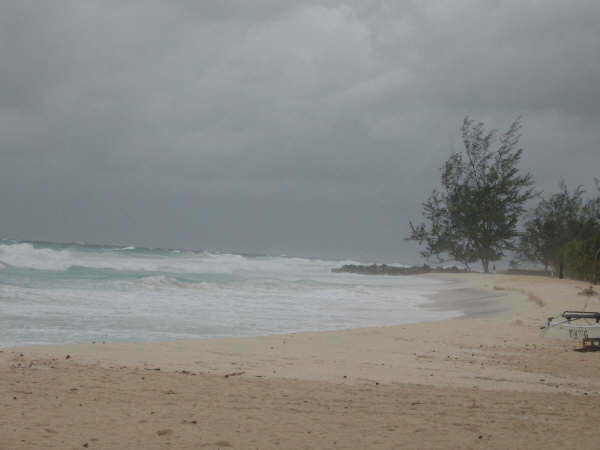 The month of May here in Barbados was a very hot one, with only 10.2 mm of rain - June arrived with a few showers and this last three days the winds are very high. It was gusting this morning at 29 mph. The high temps continue - at the airport at 2pm it registered with the heat index 95.7 degrees. Great day for the beach. - ANOTHER HOT ONE TODAY?? Here we are in the middle of the month of May - and it has been a very dry and hot hot May so far. The grass is brown again and the plants and bushes are wilting. Some days with the heating temps it has surpassed 35 degrees C. The breezes do blow but the days are certainly hot. We really do need some good showers - but nothing major - just not yet.